Is the cycle of boom and bust in California real estate truly over? With the elimination of toxic mortgage products, high prices cause demand to falter, as it should; it also signals new mortgage regulations work as planned. Over the last week as I thought about this outcome, I began to question whether or not the legislators who passed the Dodd-Frank financial reform would succeed in preventing future housing bubbles. Back in January of 2013 I wrote that the new mortgage regulations will prevent future housing bubbles, and I recently wrote that new mortgage regulations change how real estate markets work. Based on the recent evidence — declining sales caused by higher prices — I am becoming more hopeful that we really and truly are witnessing the end to the cycles of boom and bust in California real estate. If Americans are less than enthusiastic about real estate, who can blame them? Real-estate mania lives on at the HGTV cable channel, where house shoppers still holler for granite on their kitchen islands and his-and-her sinks in their en suite bathrooms. But in the non-TV reality of middle-class America, the bloom is definitely off the real-estate rose. The rose isn’t dead, mind you. 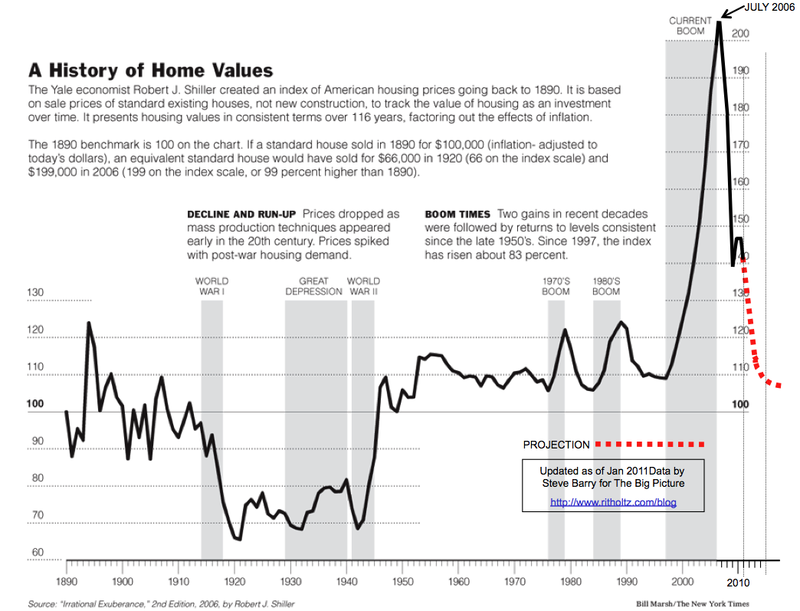 Surveys show an enduring desire to own one’s home, despite the trauma left by the real estate meltdown and recession. But the love is not what it was. Are all these negative stories about home ownership a contrarian sign that we are at the bottom of the cycle, or is it a sign that the cycle is broken and we are on a new path? Furthermore, many members of the middle class with jobs and savings no longer believe in a future of plenty. They’re seeing their neighbors slide down the economic chute.So taking on a mortgage seems a scarier prospect than before. Zavisca cites studies confirming that holding a mortgage weighs heavier on psychological well-being than it used to. During the housing bubble, people made a dangerous psychological shift: they came to believe they would not be responsible for paying off a mortgage out of their wage income — the house was supposed to do it. The house itself became regarded as a wage earner rather than an expense. Once people came to believe they were no longer responsible for the mortgage, then the size of the mortgage didn’t matter. Perhaps this blissful ignorance was good for their emotional well-being, but it was a disaster for their financial well-being. “Even for people with a lot of equity, just having a mortgage makes them feel more insecure than they did five or 10 years ago,” Zavisca said. With a mortgage now comes heightened anxiety. Great! That is what debt is supposed to do. People should not be comfortable with debt. I think debt anxiety is a great thing as it will prompt people to carry far less of it. Though Americans clearly do want to own homes, they are much less optimistic about the potential for large gains in equity. I’m always concerned I see what I am looking for, but I have not seen the return of crazy beliefs about future home price appreciation even with a strong rebound in prices from early 2012 through mid 2013. What? You can’t live off home price appreciation anymore? What amazes me is that more Americans aren’t seething over one of the biggest con jobs ever perpetrated on an unsuspecting public. The housing bubble was a product of public policy. The Fed under Alan Greenspan kept interest rates low to keep the speculative frenzy going. Financial deregulation let lenders push snake-infested mortgage contracts onto the shoulders of ordinary people. When the bubble splattered, ordinary people were left bankrupt, foreclosed upon and devastated both financially and psychologically. If Americans are less than enthusiastic about real estate, who can blame them? The biggest disappointment from the housing bust was the lack of accountability. The people responsible kept their fortunes, their reputations, and their status, and nobody went to jail. I suppose I can live with that if I can believe Americans learned the lessons of the housing bust, prompted their legislators to implement the proper regulations to prevent future housing bubbles, and let go of the foolish beliefs of the mania. Are you still a gold bug conspiracy nut if there is proof of a conspiracy and gold price manipulation? But why deal with the truth when it is more convenient to live in denial by calling them gold bugs or conspiracy nuts? June is supposed to be the peak of the selling season. Mortgage applications decreased 3.1% from one week earlier, according to data from the Mortgage Bankers Association’s Weekly Mortgage Applications Survey for the week ending May 30, 2014. This week’s results include an adjustment for the Memorial Day holiday. The Market Composite Index, a measure of mortgage loan application volume, decreased 3.1% on a seasonally adjusted basis from one week earlier. On an unadjusted basis, the Index decreased 14% compared with the previous week. The Refinance Index decreased 3% from the previous week. The seasonally adjusted Purchase Index decreased 4% from one week earlier. The unadjusted Purchase Index decreased 15% compared with the previous week and was 17% lower than the same week one year ago. The refinance share of mortgage activity increased to 53% of total applications from 52% the previous week. The adjustable-rate mortgage (ARM) share of activity remained unchanged at 8% of total applications. Interest rates for most products fell to their lowest levels in close to a year. The average contract interest rate for 30-year fixed-rate mortgages with conforming loan balances ($417,000 or less) decreased to 4.26% from 4.31%, with points decreasing to 0.13 from 0.15 (including the origination fee) for 80% loan-to-value ratio (LTV) loans. The effective rate decreased from last week. I anticipated your comment and bolded the statement about the results including an adjustment for the Memorial Day holiday…. The adjustments don’t capture the full effect of a holiday week. Next week seasonally-adjusted apps will be higher and it will be hailed as a breakthrough. While the housing market continues to make strides toward recovery following last decade’s crash, a new survey finds the majority of the American public still harbors doubts about whether the worst of it is truly over. While results in the 2014 survey were slightly more optimistic than last year, more than two in five adults believe the housing market today continues to be a serious problem. “The housing crisis that began more than five years ago has left an indelible mark on the attitudes and experiences of Americans,” said Geoffrey Garin, president of Hart Research Associates, which conducts the survey for MacArthur. At least part of that pessimism stems from challenges related to housing affordability in today’s economy, which “has driven a large share of the American people to make significant financial adjustments,” Garin said. Overall, only half of survey participants said they feel homeownership is still an “excellent” long-term investment, and just less than two-thirds feel it is less likely today for a family to build equity and wealth through homeownership than it was 20 or 30 years ago. Meanwhile, while 70 percent of non-homeowners still aspire to own a home someday, half of all adults believe homeownership is less appealing today than it used to be. Polled about their experiences, more than half of respondents said even a family earning the average income in their community would have difficulty gaining access to quality affordable housing, with that share approaching 75 percent for families living below the poverty line or young people just getting started in the labor force. Faced with these challenges, 52 percent of adults said they have had to make at least one sacrifice in the past three years to be able to cover their rent or mortgage, including taking on an additional job, cutting back on health care, or giving up their retirement savings. Given their concerns, nearly three in five respondents believe the government should be doing more to ensure there is sufficient affordable quality housing, both to rent and buy. It’s the governments actions which has caused the problem in the first place. In its latest Home Price Index, CoreLogic reported that home prices continue to rise across the nation, with more increases to come in 2015. The company reported that home prices, including distressed sales, increased 10.5 percent in April from the previous year. The company projects home prices will continue to increase by 1.0 percent month-over-month in May. Furthermore, national home prices are expected to rise by 6.3 percent from April 2014 to April 2015. “The weakness in home sales that began a few months ago is clearly signaling a slowdown in price appreciation. The 10.5 percent increase in April, compared to a year earlier, was the slowest rate of appreciation in 14 month,” said Sam Khater, deputy chief economist for CoreLogic. April marks the 26th consecutive month of year-over-year home price gains. Excluding distressed sales, CoreLogic found that home prices increased by 8.3 percent year-over-year. Unfortunately, despite the modest April gains, home prices across the nation remain 14.3 percent below their August 2006 peak. “Home prices are continuing to rise as we head into the summer months. The purchase market continues to suffer from a dearth of inventory which we expect will continue to drive prices up over the year,” said CoreLogic president and CEO, Anand Nallathambi. Excluding distressed sales, all 50 states and the District of Columbia showed year-over-year home price appreciation in April. The company found that 23 states and the District of Columbia are at or within 10 percent of their peak. Including distressed sales, the five states registering the largest year-over-year home price appreciation in April were California (15.6 percent), Nevada (14.8 percent), Hawaii (14.1 percent), Oregon (11.8 percent), and Michigan (11.3 percent). States remaining the furthest from peak values in April include: Nevada (-38.6 percent), Florida (-34.5 percent), Arizona (-29.5 percent), Rhode Island (-28.8 percent), and West Virginia (-24.2 percent). ‘Improv’ is the model, so the cycle of ‘a couple of extra digits magically appear on paper–then are suddenly deleted’ is NOT over. However… will carry on at lower levels over time simply because higher prices demand more credit, but the risk of ruin increases exponentially the more debt one accumulates. For the answers they seek, I suggest the bulls research history pertaining to how post-bubble credit collapses play-out, try critical thinking, and take-up chess. The government and federal reserve has been doing everything possible to keep the old system alive, but as you like to say, “facts are stubborn,” and they can’t hold back the forces of the market forever. Oh yes they can. It’s called fascism. When govt and private entities band together, we get things like Fannie and Freddie. Last I heard that pathetic excuse for a “private company” is going to get bigger! Yay! We also get a govt / bank controlled housing market. You are right that the days of boom and bust may behind us for a while. But we need busts! Only if we want a market that is considered “free”. Let’s face it. Housing is only for the 1-5%. Welcome to feudal America. I think the homeownership rate is about 65% in the USA. In a poll released this week, nearly one in five Americans say they don’t think owning a home is worth the risk in today’s uncertain economy. The poll, conducted by the National Foundation for Credit Counseling (NFCC), shows 18 percent of respondents are not willing to assume the risks and obligations associated with taking out a mortgage loan. NFCC says the findings are consistent with the Census Bureau’s latest household data showing a national homeownership rate of 64.8 percent in the first quarter—a 19-year low. “The housing crisis, recession and continued economic instability appear to have shaken the confidence of many Americans, particularly when it comes to big-ticket items such as a house,” said NFCC spokesperson Gail Cunningham. Indeed, while Americans have been generally optimistic about housing—with 82 percent in NFCC’s survey insisting “owning a home remains a critical part of wealth building”—banks are reporting weakening demand for loans, owing in part to tighter lending criteria and consumers’ doubts as to whether they can qualify. With so many Americans still listing homeownership as a future goal, NFCC suggests most would be better off renting until they’re fully prepared to take on all of the associated responsibilities, including paying a mortgage, home and lawn maintenance, and taxes and insurance. Let me translate for you: 18% of Americans will never be able to afford a home. The business of bundling junk-rated corporate loans into top-rated securities is booming like never before after the implementation of regulation aimed at making the financial system safer. More than $46 billion of collateralized loan obligations have been raised this year in the U.S. through the end of May, after $82 billion were sold in all of 2013, according to Royal Bank of Scotland Group Plc. JPMorgan Chase & Co. boosted its annual forecast to as much as $100 billion, which means 2014 may end up as the biggest year on record, while Onex Corp. said yesterday it will expand its CLO business. There will always be peaks and valleys in any cyclical system. The housing boom/bust cycle reflects the business boom/bust cycle. As jobs are created/destroyed demand for housing rises or falls. Rising demand drives up prices and drives up salary costs for geographically constrained areas like California. This is cost-push inflation; i.e. rising housing prices drive up salaries and impact corporate bottom lines. The response to this is either to raise prices, automate, or transfer job functions to lower cost areas either nationally, or globally. In a competitive environment prices are unlikely to rise much, so some job functions will relocate, and some will be replaced with newly competitive machine processes. Some specific-skill jobs can’t be transferred to lower cost environments from lack of skilled workers in these areas, or lack of consumers in those areas (healthcare). So these salaries will have to rise to match rising housing costs. There is also a lag between when salaries start to rise and when they impact bottom lines. During expansionary periods, product sales are rising and profits are rising as excess capacity is taken up. So overhead rates fall and can be used to offset rising salaries. It is only when maximum capacity is reached when salaries show effect on revenues and compete for capital needed to expand capacity. In a low-rate environment, however, borrowing for corporate expansion is relatively cheap, so even at peak capacity, rising sales can still drive salaries higher. Eventually the expansionary cycle gets ahead of itself, and the economy contracts, and all the effect of the bad leverage rears its head. This is when the value of Dodd-Frank is seen. The recessions should be less as debt is kept to sane levels. I think the main impact of Dodd-Frank, and other regulations is to limit the amplitude of the peaks and valleys, not to eliminate them all together. The cycle frequency may increase as well as the time to recover from past manias falls as amplitudes are capped by ATR and full-doc loans. Peaks always seem to occur when volumes thin out. As buyers hit the leverage wall, cash sales have greater market share. For those with cash to burn, leverage isn’t a factor. Only when those with excess flammable currency run short will prices knee over and the cyclic peak become apparent. Very astute observation, as always. Thank you. California has been having booms and busts since the end of WW2 and the risky financing was only a factor in the most recent cycle. Since Dodd-Frank was designed to limit risky financing, it’s reasonable to assume that future boom/bust cycles won’t reach the same magnitude of the mid-2000’s cycle (about twice the normal size of a typical bubble), but there’s no reason to believe that housing booms and busts won’t continue to occur with the same regularity. For California, that regularity is about once every 10 years. Actually, California had affordable housing up through the early 1970s. The passage of CEQA greatly restricted the ability of builders to provide product, so when prices started rising in the early 1970s, it became a full-blown bubble because supply couldn’t be brought to the market. The culprit in the 1970s was excessive DTIs. Lenders bet on continued wage inflation and allowed 65% DTIs that people would earn their way into after several years of 10%+ wage growth. This inflation expectation allowed a bubble to form in the absense of toxic mortgages. Fortunately, DTIs were also capped at 43% by Dodd-Frank, so we won’t repeat that one. The other bubbles were inflated by the same supply constrictions supplemented with toxic mortgage products, which are now banned. I think there is reason to believe the cycles of boom and bust may be curtailed if not completely eliminated. I know you’re set in your viewpoint, but you can use the 100+ year shiller chart to see that there were a couple of booms between WW2 and 1970. The largest boom occurred immediately after WW2, when prices increased over 20% in REAL terms and then crashed by 10% shortly thereafter. During the 1950’s, there was another smaller boom/bust with a 15% increase in REAL terms that slowly deflated well into the 60’s. I would not be so confident of the curtailment. The banks always seem to find new and different ways of exploiting various markets. The government is also quite the enabler. When things seem to calm down the government may once again repeal regulations. I think it’s better to channel anxiety toward things you have control over. Housing prices are not it. It’s interesting, yes, but whether you borrowed nothing or borrowed $500K+, what control do you have over home prices? Maybe I’m off based, but it seems to me that the more immediate and pressing concern should be leveled at whether you will be able to sustain gainful employment (income) over the next several years given economic issues and job trends, and the probability of same rather significant national defaults and currency crises. I know from the many people I’ve talked to that nobody in the homebuilding or land development industries is complacent about their jobs. Nobody believes there is any job stability in that industry long term.